Quantiferon TB-Gold'- A powerful Diagnostic Tool for Tuberculosis!!! Tuberculosis is an infectious disease that usually affects the lungs. But the responsible bacteria, Mycobacterium tuberculosis, can also damage the other parts of the body. According to WHO, compared with other diseases caused by a single infectious agent, tuberculosis is the second biggest killer, globally. In 2015, 1.8 million people died from the disease with 10.8 million falling ill. It is a whole-blood test for use as an aid in diagnosing Mycobacterium tuberculosis infection, including latent tuberculosis infection (LTBI) and tuberculosis (TB) disease. This test was approved by the U.S. Food and Drug Administration (FDA) in 2005. Blood samples are mixed with antigens (substances that can produce an immune response) and controls. For QFT-G, the antigens include mixtures of synthetic peptides representing two M. tuberculosis proteins, ESAT-6 and CFP-10. After incubation of the blood with antigens for 16 to 24 hours, the amount of interferon-gamma (IFN-gamma) is measured. If the patient is infected with M. tuberculosis, their white blood cells will release IFN-gamma in response to contact with the TB antigens. The QFT-G results are based on the amount of IFN-gamma that is released in response to the antigens. Clinical evaluation and additional tests (such as a chest radiograph, sputum smear, and culture) are needed to differentiate between a diagnosis of latent TB or active TB. QFT measures the cell-mediated immune response (cytokines) to very specific TB antigens. The test is performed by collecting whole blood (1 mL) into each of three blood collection tubes. When the blood of an infected patient is stimulated with the M. tuberculosis-specific antigens in QFT, their T-Cells respond by secreting a cytokine called IFN-y. The IFN-y concentration in the plasma is determined using a sensitive ELISA. 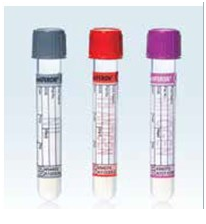 QuantiFERON-TB Gold blood collection tubes. (L to R) Nil tube (negative control), TB Antigen tube, and Mitogen tube (positive control). Figure 1. Workflow from blood collection and sample assay setup to the calculation of results, using ELISA technology and QFT analysis software. Requires a single patient visit to draw a blood sample. Results can be available within 24 hours. Does not boost responses measured by subsequent tests, which can happen with tuberculin skin tests (TST). Is not subject to reader bias that can occur with TST. Is not affected by prior BCG (Bacillus Calmette-Guérin) vaccination. There is limited data on the use of QFT-G in children younger than 17 years of age, among persons recently exposed to M. tuberculosis, and in immunocompromised persons (e.g., impaired immune function caused by HIV infection or acquired immunodeficiency syndrome [AIDS], current treatment with immunosuppressive drugs, selected hematological disorders, specific malignancies, diabetes, silicosis, and chronic renal failure). Errors in collecting or transporting blood specimens or in running and interpreting the assay can decrease the accuracy of QFT-G.
Limited data on the use of QFT-G to determine who is at risk for developing TB disease. The interpretation of the TB Gold Quantiferon Assay is very straight forward as long as it is Positive or Negative; however, an indeterminate result suggests an invalid result. Take into consideration that the assay is measuring the release of gamma interferon due to the activation of the T helper cells and macrophages by an antigen. Taking it step by step, first, evaluate the Nil and then the mitogen result. Note: A low-mitogen result, in conjunction with a negative TB result, is classified as an indeterminate result. The NIL indicates the presence of any residual gamma interferon found in the patient’s blood due to an infection (e.g. virus, fungus, intracellular bacteria, etc.). The NIL tube value indicates if the patient has an ongoing immune response which can cause a false-positive result. The NIL tube must be a value of no greater than 8.0 IU/mL. The mitogen control tube addresses the immune competence of the patient’s immune cells. Thus a patient on immunosuppressive therapy/drugs, chemotherapy, lymphopenia, an inability of patient’s lymphocytes to generate gamma interferon, etc., will have very little response to the mitogen indicating its inability to respond to an antigen. Thus a low response to mitogen (<0.5 IU/ml) indicates an indeterminate result. Then retesting required after 30-60 days. The mitogen tube also serves as a control for indicating long or improper transport, incorrect blood handling, and incubation. If technical issues are suspected with the collection or handling of blood samples, repeat the entire quantiferon test with new blood specimens. The mitogen tube acts as a false negative control. The mitogen tube must demonstrate a gamma interferon value of equal to or greater than 0.5 IU/ml higher than the value of the NIL tube. The TB antigen tube is coated with Mycobacterium tuberculosis specific antigens. The results must always be interpreted in light of the clinical presentation of the patient. A positive quantiferon result is meaningful and even without a history of recent contact indicates that an M. tuberculosis infection is very likely. The quantiferon assay does not differentiate between recently acquired or old infection, or between a latent TB infection and active tuberculosis. Also interpret cautiously because infections by other mycobacteria (e.g. M. kansasii) can generate a positive result. For a test to be considered positive, the TB antigen tube value minus the NIL tube must be equal to or greater than 0.35 IU/ml. Hope you understand about Quantiferon-TB Gold test (QFT-G). Have a good day. To find all kind of job circular you can visit my site.